Last week brought the surprising news that Intel was teaming up with its long-time rival AMD to create mobile CPUs with integrated graphics to enable thinner, lighter, and more powerful laptops. The new systems are set to arrive in the first quarter of next year, but we might have already seen images of an early sample. The leaked photos comes from Chinese rumor forum Chiphell. 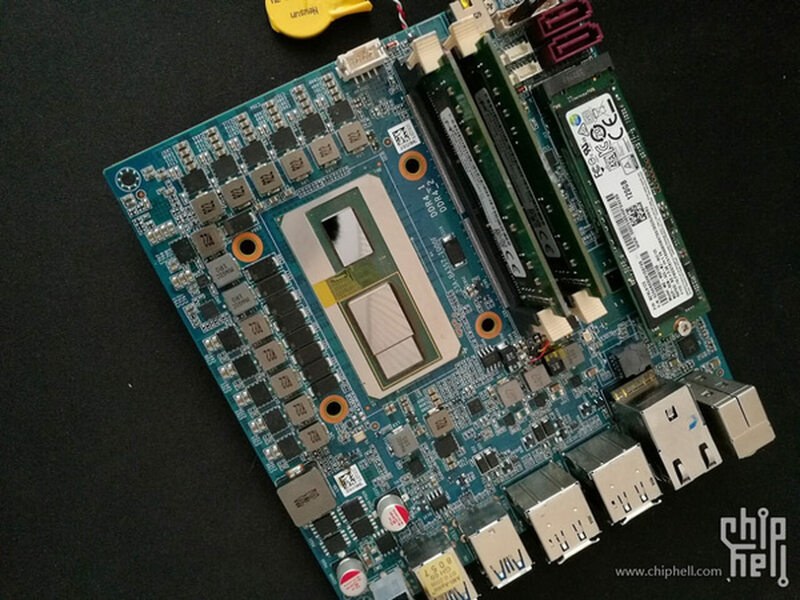 It appears to show an Intel NUC motherboard packing the Intel/AMD product. Techreport believes that the GPU die is around the same size as the Polaris 20 chip found in the Radeon RX 580, while the entire package is estimated to measure around 2.5cm²—larger than a standard CPU. We know that the as-yet unnamed product will be based on Intel’s 8th generation Core family and feature second generation High Bandwidth Memory (HBM2) along with an Intel-exclusive, semi-custom discrete graphics chip from AMD’s Radeon Technologies Group. Assuming the photo isn’t a fake, the size of the graphics chip and the single stack of HBM2 suggests we could see graphics performance comparable to a midrange desktop GPU. The 3DMark 11 performance benchmark discovered by Wccftech puts it somewhere between the GTX 1050ti and GTX 1060—similar to the Radeon RX570, though with 24 compute units instead of the 32 CUs found in AMD’s card. The day after Intel and AMD announced its partnership, Raja Koduri, the head of the Radeon Technologies Group, left the company and joined Intel to oversee its Core and Visual Computing Group. Back in May, Nvidia unveiled Max-Q, a new type of design philosophy that enables super-thin, power-efficient laptops. Unlike upcoming devices featuring Intel/AMD’s package, Max-Q laptops rely on dedicated GPUs, but improvements to the overall design, chips, game drivers, and the thermal and electrical components allow products such as the ROG Zephyrus, which contains a GTX 1080 with 8GB of GDDR5 inside a chassis that’s 17.8mm thick and weighs 2.3 kg.